How long does it take to get my body back after having a baby? This mama job is tough. Yes, it’s full of beautiful, pure, joyful moments, but it can also be incredibly challenging, exhausting and frustrating. New mums are not only confronted with perhaps the steepest learning curve of their life, but they are also living in a body that no longer feels or looks like their own. fit into your pre-pregnancy jeans? be as fit as you were before bub? look as toned as you did before bub? have a tummy as flat as you did before bub? have a pelvic floor as strong as it was before birth? For some Mums, it’s ‘all of the above’, but others may have a very specific goal in mind. Are you basing your goals for getting your body back on your actual pre-pregnancy body; a combination of your genetics, your age and your lifestyle at that time? Or are you measuring yourself against your friends, celebrities or women on social media (insta-mums)? Setting unrealistic expectations on what it means to ‘get your body back’ will also set you up for disappointment. Pregnancy is a journey that is different for every woman. So many factors in your pregnancy can affect how long it will take to ‘get your body back’. 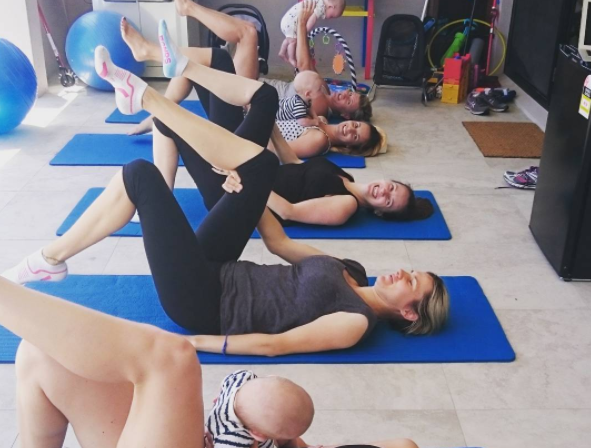 A mum who was on bedrest from 20 weeks with a pregnancy complication is going to have a very different experience to one who was doing spin classes until she was 40 weeks pregnant. Similarly, a mum who had her first bub prematurely at 30 weeks is going to have a different experience to one who carried twins until 37 weeks or one who had a large abdominal separation. Hard and fast rules simply can not apply when pregnancy is such a unique journey. I am very aware that “it depends” does not seem very helpful when all you want is ANSWERS!! So, I will break down the postnatal period into timeframes and describe what sort of recovery I tend to see in women during these stages. Most women during this period are focused on getting to know their new bub and are consumed with all of the challenges of new motherhood. Some might have resumed a bit of gentle exercise and some might even be back in their pre-pregnancy clothes. But very rarely do I see someone who feels that they’ve got their ‘body back’. Most still have a squishy belly and don’t feel strong or fit. This is when I see more women begin to feel a bit more like ‘themselves’. They are starting to get the hang of being a new mum and are starting to see the importance of making some time for themselves occasionally (even if it’s just coffee with a friend!) Many women have increased their exercise or activity level and some may return to their pre-pregnancy weight. That being said, even for the mums who have returned to a weight they are happy with, most feel that they still lack strength and tone and many are starting to feel some ‘niggles’ associated with being a mum (low back ache, mid back pain, wrist pain etc). Many mums become bothered by their ‘mummy tummy’ at this stage and this is when I am most often asked how long it will take to ‘get their tummy back’. By this stage, many women who have been exercising / active have returned to a fairly normal routine (or one that fits within their new life as a mum). They might be running (if this is their goal), they might be doing some regular strength work in the form of Pilates / other training and they generally feel fitter and stronger. For the women who have had the correct guidance (eg from a good physio or a professional who specialises in the area) many are able to exercise and function without pain, without pelvic floor dysfunction and are starting to feel they are getting back to their pre-pregnancy body. Along with this, many are starting to feel that their tummy looks flatter and that their general abdominal strength is returning to ‘normal’ (if they have been consistently working on it). For the women who have not been exercising or have received poor (or no) advice, many still feel they lack strength and tone, many have niggles/pain and many are not happy with the look of their tummy. After 12 months, many women feel they have their ‘body back’, especially if they have received good advice and have put the work in. Their skin might not be as ‘tight’, their breasts might not be quite as perky, and they may carry with them a few visible (or not) reminders of pregnancy and birth but many are feeling more like their pre-baby selves. For some women, getting their body back is not high on the agenda. They might be in a post-baby haze for the first 12 months or they might just lack the energy, motivation or time to make their body a priority. These women will still have a certain amount of natural healing / recovery but any further improvements will only come with the right combination of exercise and diet that is appropriate for them. These improvements may take a further 9-12 months, but are completely achievable with good guidance! Remember, we are always here to help! If you have any questions about getting your postnatal body back, please feel free send us an email below. We love hearing from you.